Michel Alexis breaks up language into playful and sensuous fragments of the unconscious. The initial source of Michel Alexis’ recent work is Gertrude Stein’s Birthday Book, written in 1924, and originally intended to be published with Picasso’s engravings. To bring together Stein’s fragmented thoughts, Alexis employed distinct techniques that acted simultaneously as agents of both unification and dissolution. In “September 4,” black lines resembling childlike script scrim over a background of dark tones. Outlines of what could become letters are frozen on a space of raw symmetry, while a few stragglers are ejected in disarray through space. A compounded process of dichotomization is revealed through paradoxes of equilibrium and chaos, essence and decay, rusticity and refinement. In “June 28,” rice paper is pasted flatly on the surface of the canvas in a grid. Over the geometric design, Alexis soaks, scrunches and crumples-up strands of rice paper to resemble fossil-like lifeforms caught in stone. 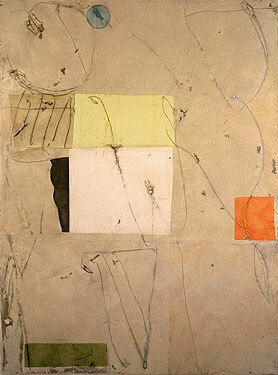 Ochre, yellow and pink paints thinly blend throughout the paper, resembling glyphs and jamming the composition. A sense of impending force emanates from these forms. They press against each other, resisting and overlapping, snaking across a sand-toned background. Underneath it all lay Stein’s words, gradually emerging on small fractions of the canvas as fading ghosts of history. In “July 1,” glazed ochres abound, symmetrically pasted over the canvas. Deviating lines explode throughout the contingent space, obliterating the frail structure of the paper grid. Delicate designs rise off the antiqued sienna, indulging in the sensuality of large brush strokes and the dripping of diluted earth tones. In all of Alexis’ work there is a stunning mix of sensuous medium and implied content. Aspects of eerie underwater worlds, Egyptian chambers and organic language create rich new worlds for our imaginations to contemplate.